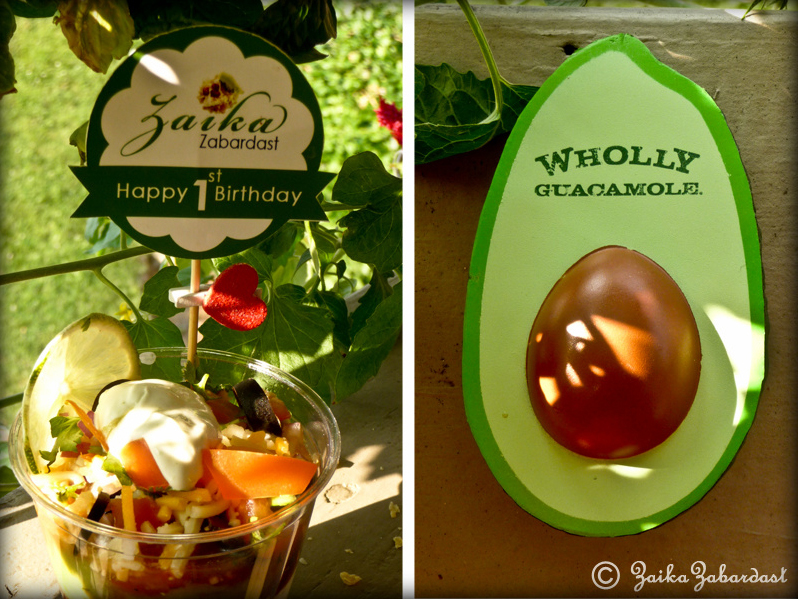 Yet another giveaway time :).The birthday celebration continues with the most trusted Wholly guacamole giveaway! 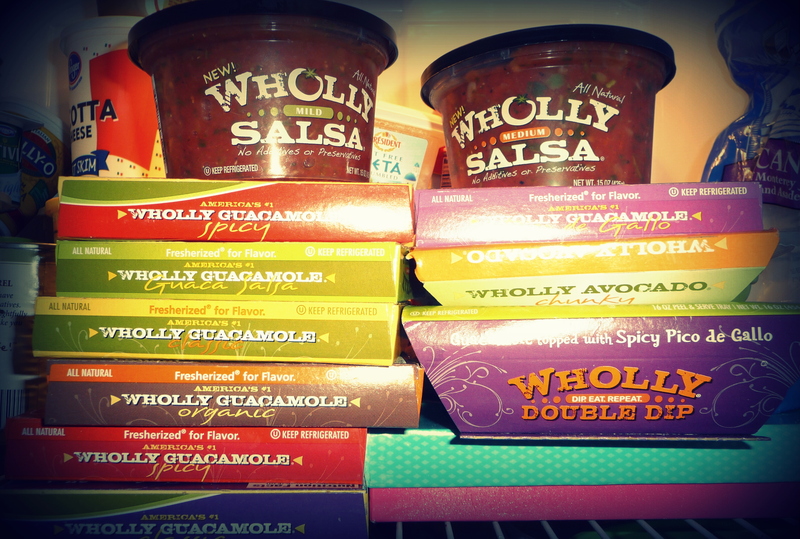 Yup, this giveaway is sponsored by Wholly guacamole. I will get back to the giveaway in a while. At first let’s talk about how I ended up with 10 delicious packages of Wholly products at my door. Somewhere in March, I entered one of the giveaways on my friend Katie’s blog and luckily I was the winner of 10 packets of Wholly products. Take a look at the variety of products I received. Few packets are still left in my freezer. I always loved Wholly products so it was a perfect treat for me BUT the only question was what will I do with all this guacamole. I mean I do love avocado and I am crazy for guacamole but too much of everything is just too much, isn’t it? But thanks to Wholly guacamole that I can freeze their guacamole and salsa. And when I need it, just take one package out, defrost and enjoy. So convenient. You know what is the best thing to like about Wholly? You do not taste preservative at all. Because it is made of all natural ingredients – just like homemade. 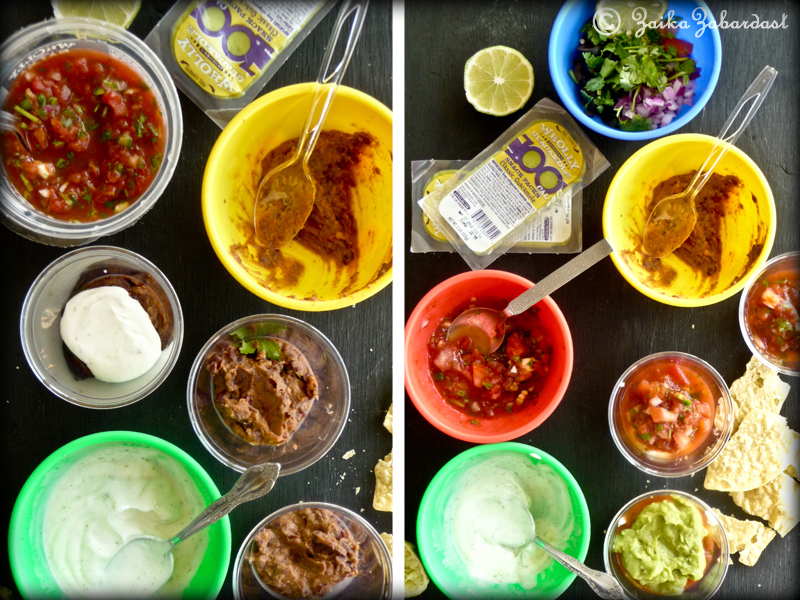 Coming back to the recipe – This Mexican dip is one of the staple evening snacks in my house. It always makes a nice appetizer and guests love it. Healthy, flavorful, easy to make and crowd pleased! Two thumbs up! In a bowl, mash beans using potato masher or fork. In a saucepan, heat oil and sauté garlic for a minute. Add mashed beans along with taco seasoning mix, some salt, ½ cup of water and cook for about 5 minutes. Once cooked, let it cool down completely before serving. (Add more water if needed). Make lime seasoned Greek yogurt: In a bowl mix low-fat Greek yogurt, lime zest and a tsp of lime juice. Keep it aside. Makes 6 servings in individual cups, follow the steps mentioned below. If you prefer, you can even layer out everything in a 9”pie plate. Layer a big spoon of everything on the. 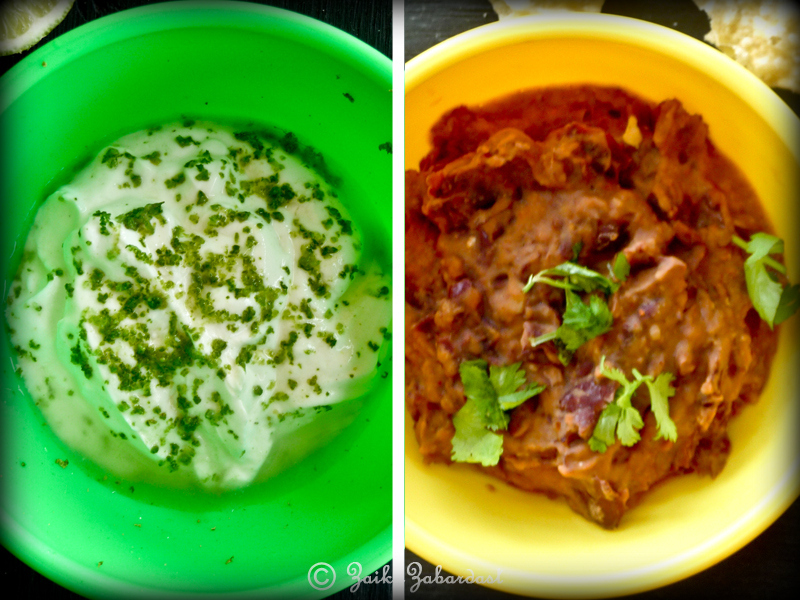 Start with beans, seasoned yogurt, salsa, guacamole and chopped vegetables and cheese. 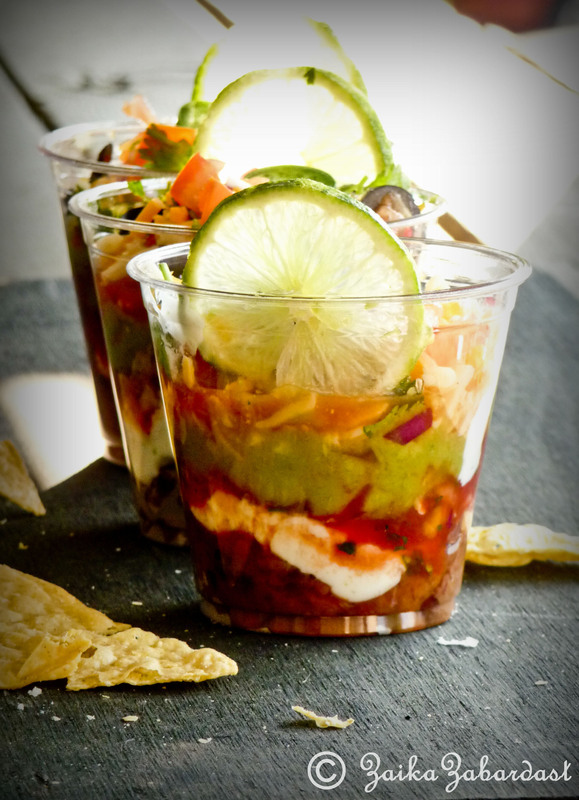 Serve with tortilla chips or vegetable sticks. 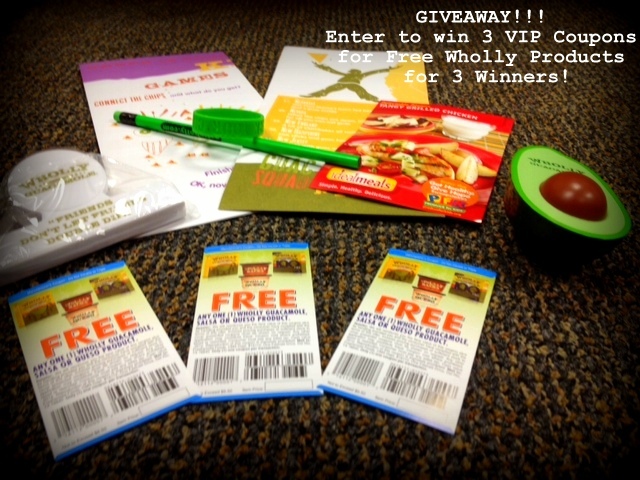 Wholly Guacamole is generous enough to giveaway 3 VIP Coupons for FREE Wholly Guacamole products for 3 lucky Winners. So if you are one of the winner, they will ship you 3 VIP coupons with some of their cute goodies. This giveaway is open until Thursday (5/31/12) 11:59:59 pm (your time). I will pick three lucky winners on Friday (06/01/12). Because of Memorial day long weekend holiday here in USA, I am extending the giveaway deadline for another week. Now the giveaway is open until Thursday (06/07/12) 11:59 pm (your time). I will pick three lucky winners on Friday (06/08/12). Follow Wholly Guacamole on Twitter. Folly Wholly Guacamole on Facebook. Tweet about this giveaway saying: “I just entered to win Free Wholly Guacamole products from ZaikaZabardast http://wp.me/pTI6E-t1@zaikazabardast @eatwholly” or something like that. ← Pan fried Bruschetta with Thai chutney and another giveaway! 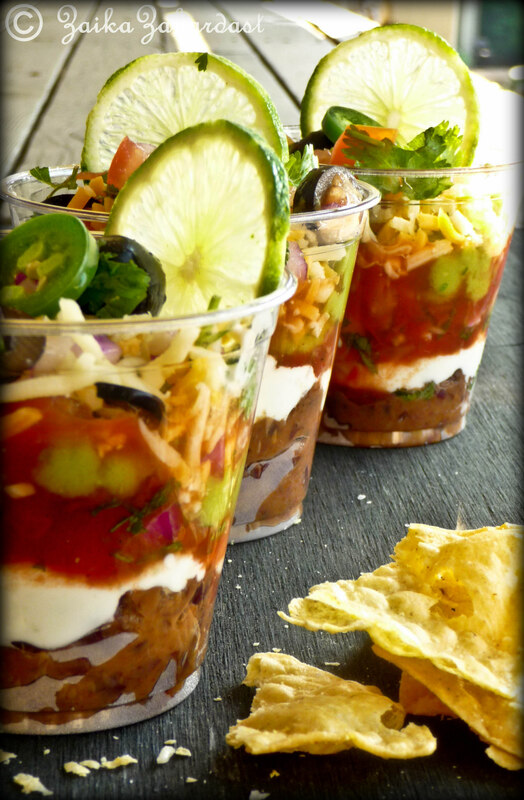 Absolutely love your individual layered dips. I’m doing this for my next party. LaTanya, Unfortunately I have to pick another winner because I did not hear back from you in last 72 hours. Sorry! Congratulations Jennifer for winning this giveaway! Please claim your price with your address in 24 hours or I will have to pick another winner to replace you. I like Wholly Guacamole’s FB page. I love.love.love. Wholly Guacamole. I especially like it because there are no preservatives and it’s so convenient! Thanks for the great recipe, too. I pinned it for future parties! btw I love this appetizer idea! Love your Blog especially your recipes with fresh veggies. Cannot wait, I will make this tonight, my mother is visiting and she will love it too.